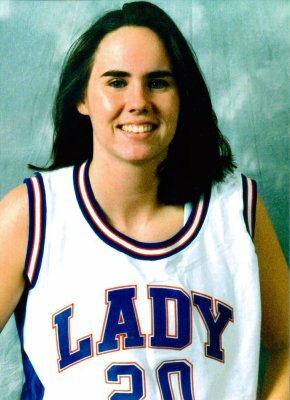 A strange string of coincidences forever links the sports careers of Becky Stitt Plott and Mandy Miller, two of the dozen new inductees in this year’s class of the Huntsville-Madison County Athletic Hall of Fame. Consider these facts: Both were born just six days apart in the summer of 1975, Becky on July 18 and Mandy on July 24. Through sports, the two became spirited but friendly competitors, Becky at Grissom High School and Mandy at archrival Huntsville High. Both were among the city’s most versatile young female athletes of their era. Both played and starred in volleyball, basketball and softball. Both experienced the thrill of playing for state championships and both accumulated multiple A ll-City and All-Tournament honors. Both were volleyball teammates for the North Alabama Spikers Association – Huntsville’s other NASA. As seniors on their respective basketball teams, both suffered devastating leg injuries just weeks apart that abruptly ended their high school athletic careers. After long months of rehabilitation, both wound up playing collegiate volleyball, Becky at the University of Alabama in Huntsville and Mandy at the University of Alabama in Birmingham. What are the odds? Nearly a quarter-century later, Becky Stitt’s remarkable exploits in volleyball, basketball, and softball are still remembered fondly at Grissom High School. There is much to remember. “I was so fortunate to come through high school at a time when we had so many other talented athletes and amazing coaches," Becky said. In volleyball, Grissom was state runner-up her sophomore year and state champions her junior and senior seasons. Her best volleyball memory came in her junior year at the doubl -elimination state tournament. “We lost to our bitter rival, McGill-Toolen, but managed to come out of the loser’s bracket to meet them again in the finals," she recalled. “We were faced with the huge task of having to beat them twice. We battled them and played two of the most intense and closest games of my life. We came away with the state championship and I still have visions of being at the bottom of that dog pile. Playing for a coach like Gloria Birmingham was a dream come true." It was the same with her basketball coach, Phil Holladay, who once said of Stitt: “Becky has played more sports than anybody I can ever remember coming through Grissom. She’s probably one of the best all-around athletes we’ve ever had. Maybe the best." Holladay had the good fortune of coaching both Stitt and Tiffany Martin, a Hall of Fame inductee in 2016. After finishing state runner-up in 1991-92, Grissom was favored to win it all in the 1992-93 season. “My senior year was going well and we were ranked No. 1 in the state," Becky recalled. Then fate intervened on the night of Jan. 23, 1993. “We were playing Athens and I was having one of those games where I was in the zone," remembered Becky. “Tiffany drove the ball down the court and passed it to me in the corner. A girl from the other team came running at me, trying to block it. I shot the 3-pointer and as I was watchin g it go in, I heard what sounded like a gunshot. I made the shot, but then I was lying on the floor with my leg snapped in half. I was in disbelief and as they were trying to get an ambulance to the gym. My only concern was trying to figure out how to prop myself up at the free throw line." She had broken both the tibia and fibula bones of her right leg. “I had surgery the next day and my senior season was over," she said. “We ended up losing the state finals, and I blamed myself for that loss for many years. Eventually, I realized God just had different plans for me." Despite her serious basketball injury, the University of Georgia honored its prior volleyball grant-in-aid to Becky. But after struggling physically and emotionally with the injury for a semester at Georgia, she returned home, underwent additional surgery on the leg, and then transferred to UAH with an offer to play both volleyball and basketball. “Being at UAH and playing two sports was where I was meant to be," she says, “and I would’ve never ended up there without going through so much adversity." At UAH, a fully recovered Becky Stitt picked up where she left off in high school, this time on the volleyball and basketball courts of Spragins Hall. Her favorite volleyball memory in college came in 1998 when coach Laura Taube’s Chargers went to the NCAA regionals for the first time in school history. “We played in a very competitive conference and that was a huge accomplishmen t," Becky said. “We had some great volleyball teams during my years at UAH and we surpassed a lot of expectations." Her best memory from college basketball was a year earlier when UAH played Alabama A&M in the Mayor’s Cup at the Von Braun Arena for the first time. “It was my first game back after finishing the volleyball season and we won an exciting game. It was one of my better games. I’ll never forget the feeling of playing in that environment." Becky says her entire family – her father Harold, her late mother Virginia, her twin sister Amy and older sister Mary Lee – deserve much of the credit for her successes in athletics. “My parents did whatever it took to make sure I had every opportunity to succeed, and my older sister and twin sister gave up many things so that I could participate in so many sporting events. This (Hall of Fame Award) will be hung in my parents’ house because it belongs to my entire family." All her honors, she said, will always pale in comparison to the heroic military feats of her father, who flew many combat missions in Huey helicopters in two tours of duty (1967-68 and 1970-71) during the Vietnam War, earning a Purple Heart and the Distinguished Flying Cross. In 2016, Harold Stitt was inducted in the Madison County Military Hall of Heroes. Becky Stitt Plott is now a teacher and coach at Westminister Christian Academy. “I’m grateful for a supportive husband and children," she said. “My husband, Charlie, has always loved unconditionally and never waivers with his support in whatever I do. My children, Justin and Ashlyn, and my stepsons, Taylor and Bryan, are my biggest accomplishments in my life."